Tabs are overlapping sections in the user interface. The Tabs header can be vertical (Tool Shelf) or horizontal (Properties Editor, User Preferences). Vertical tabs can be switched with the Wheel within the tab header and Ctrl-Wheel changes tabs from anywhere in the region. You can also cycling through tabs with Ctrl-Tab and Shift-Ctrl-Tab. The smallest organizational unit in the user interface is a panel. Panels can be collapsed to hide its contents. They are used in the Properties Editor, but also for example in the Tool Shelf and the Properties region. In the image on the right there are three panels: Transform, Edit and History. The Edit panel is expanded and the other two panels are collapsed. A triangle on the left of the title shows the expanded (▼) and collapsed (►) state of the panel. A click with the LMB on the panel header expands or collapses it. Pressing A expand/collapses the panel under the mouse pointer. A Ctrl-LMB click on the header of a specific panel will collapse all other panels and make this the only expanded one. Dragging with LMB over the headers will expand or collapse many at once. You can change the position of a panel within its region by clicking and dragging it with the LMB on the grip widget (::::) in the upper right corner. Often it is desirable to view panels from different tabs at the same time. This has been solved by making panels pinnable. A pinned panel remains visible regardless of which tab has been selected. You can pin a panel by Shift clicking its header, or by RMB clicking on the header and choosing Pin in the context menu. In the image shown to the right, is an example of the Mesh Options pinned in the tools tab. The zoom factor of a whole region with panels can be changed by Ctrl-MMB clicking and moving the mouse anywhere within that region or use the NumpadPlus and NumpadMinus to zoom in and out the contents. Pressing Home (Show All) will reset the zooming at the screen/panel focused by the mouse pointer. The alignment of the panels in the Properties Editor can be changed between vertical and horizontal. 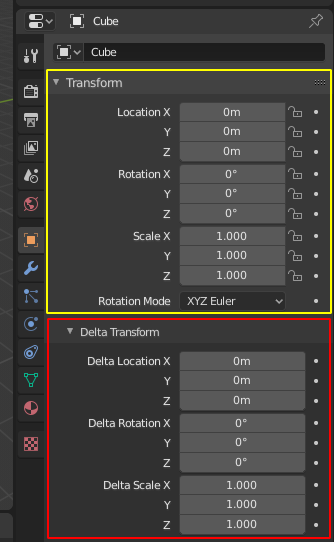 To do this click with RMB somewhere within the main region of the Properties Editor and choose either Horizontal or Vertical from the appearing menu. Keep in mind though that the panels are optimized for vertical alignment.